Rustic Meadows - Bringing you a few of our recipes! Some of our favourite recipes were requested at our Open House, so we thought why not share them on our website...enjoy! Everyone I serve this to wants the recipe! Cut squash into eight large pieces. Place cut side up in a 15" x 10" x 1" baking pan. Cut 1/4" off tops of onion & garlic bulbs (the end that comes to a closed point). Place cut side up in baking pan. Brush with oil; sprinkle with thyme. Cover lightly & bake at 350 degrees F for 1-1/2 to 2 hours or until vegetables are very tender. Uncover & let stand until lukewarm. Remove peel from squash & onions; remove soft garlic from skins. Combine vegetables, broth & cream. Puree in small batches in a blender or food processor until smooth; transfer to a large saucepan. Add parsley, salt & pepper; heat through (do not boil). Garnish with thyme if desired. Yield: 8 servings (2 quarts). An absolute standby for a buffet table or to take to a pot-luck. Spread cream cheese in bottom of 8" or 9" pie plate. Cover with seafood sauce. Scatter shrimp over top. Scatter grated cheese over shrimp. Amounts of each ingredient depends on your personal taste. Personally, I like a medium amount of sauce, but lots of shrimp & cheese! In a bowl, beat the egg & milk. Stir in cheese, oats, onion & salt. Add beef & mix well. Shape into eight loaves; place in a greased 13" x 9" x 2" baking dish. Combine ketchup, brown sugar & mustard; spoon over loaves. Bake, uncovered, at 350 degrees F for 45 minutes or until the meat is no longer pink & a meat thermometer reads 160 degrees. Yield: 8 servings. Beets are so delicious and so underrated. They have stunning colour, great texture and sweet taste. Baking beets brings out all the flavour! 1. Wrap beets in foil in single layer. Bake in preheated 400 degrees ferenheit / 200 degrees celcius oven until very tender, about 1 hour. Pierce with tip of sharp knife to see if they are ready. 2. Cool beets slightly. Trim ends and peel while still warm (it is easier). Cut into wedges. 3. Heat oil in large non-stick skillet. Add beets and toss to coat with oil. Add vinegar and sugar. Bring to boil. 4. Add rosemary and water. Cook until liquid evaporates and beets are well glazed. Season with salt and pepper. Sprinkle with chopped chives before serving. Cut each potatoe into 8 wedges, place in large resealable plastic bag. Add oil, salt, and pepper. Shake to coat. Arrange in single layer in 10 x 15 x 1 baking pan coated with non-stick cooking spray. Bake, uncovered, at 425 degrees for 20 minutes. Turn potatoes, sprinkle with parmesan and garlic. Bake 20 - 25 minutes longer or until golden brown, turning once. This was a HUGE hit at my annual Christmas open house! In a medium bowl, blend cheeses with 2 tbsp maple syrup. Shape into a ball & chill until firm. Pour remaining maple syrup over the ball & roll in pecans. Wrap well & refrigerate until ready to serve. Tasty little morsels that looked like you fussed a lot more than you did! In a mixing bowl, cream butter & icing sugar; gradually add flour. Shape a tablespoon of dough around each cherry half, forming a ball. Place 1 inch apart on ungreased baking sheets. Bake at 325 degrees F for 18-20 minutes, or until bottoms are browned. Roll warm cookies in additional icing sugar. Cool on wire racks. Yield: about 2 1/2 dozen. I experimented with these for a recent barn meeting & they went over very well. Any left-over topping is GREAT in a cup of hot chocolate!! In microwave-safe bowl, melt chips & butter, stir until smooth. Stir in extract, sugar & eggs. Combine flour & baking powder; gradually stir into chocolate mixture until smooth. Fill paper-lined muffin cups half full. Bake at 350 degrees F for 15-20 minutes or until a toothpick comes out clean (they will fall in centre). Remove to wire rack to cool. Microwave marshmallows & milk in 2-minute increments, stirring until smooth. Stir in extract. Cover & refrigerate until cool. Fold in whipped cream. Refrigerate until of spreading consistency (an hour or more). Spread over muffins or top each with a dollop. Chill at least 1 hour. Store in the refrigerator. A micro-waved sweet made in 5 minutes. It will keep two to three weeks in a covered box in a cool place. Place chocolate squares and butter in a microwave-safe bowl. Microwave on High for 2 minutes, stir, nuke again until all squares have melted. Add nuts & raisins & stir. Spread on a piece of waxed paper set on a cookie sheet. Cool. Break into pieces. VERY rich�you�ll want to serve this in small (but delicious) portions! Heat oven to 375 degrees Fahrenheit. Prepare pastry. In small bowl, combine cream cheese, 1/3 cup sugar, salt, 1 tsp vanilla and 1 egg; beat at medium speed until well blended. Spread in bottom of pastry-lined pan. Sprinkle with pecans. In small bowl, combine all topping ingredients; beat on medium speed JUST until blended. Gently pour topping over pecans. Bake at 375 for 35 to 40 minutes or until centre is firm to touch. Refrigerate leftovers. 8 servings. An absolute standby for student & Rockwood Trail Riders meetings--Sheila once said "I never realized you could make a meal out of Chocolate Chip Cookies......"
Melt butter. Add remaining ingredients in the order given. Drop on cookie sheet and bake at 400 degrees Fahrenheit. 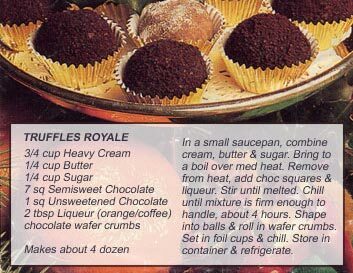 "Here's a sweet treat for your Valentine from my Webmaster"
This recipe was my younger brother's standby whenever it was his turn to make supper. Tear off a 5 foot length of aluminum foil, fold double with the shiny side in. Combine catsup & flour, spoon 1/2 of mixture in centre of foil. Place steak on top, season with salt & pepper as desired. Cover meat with onion slices & remaining catsup mixture. Sprinkle with lemon juice or top with lemon slices. Fold foil over & seal edges securely. Place in a shallow baking pan. Bake in a very hot oven (450 degrees) for 1 & 1/2 hours or until the meat is tender. Remove foil, cut steak into pieces. Use 1 1/2 cups water & juice from a can of pineapple tidbits. Combine with 3 tbsp brown sugar, 1/4 cup vinegar, 1/4 cup ketchup, 1 tbsp soya sauce & 1 heaping tbsp corn starch. Cook over medium heat until clear & starting to thicken. Add pineapple chunks & add to approximately 3 pounds of spareribs. Serve over hot rice or noodles. Variations: add chopped sweet mixed pickle, chopped pimento, or chopped mushrooms. Here's an often-requested recipe for lunch on those cold winter days. Nothing like hot soup for comfort food!! These bars have the old-fashioned taste of gingersnaps, but they're chewy and quick to fix. In a mixing bowl, combine butter, 1 cup sugar and molasses. Beat in egg until smooth. Combine flour, baking soda, cinnamon, cloves, ginger and salt; stir into the molasses mixture. Spread into a greased 15"x10"x1" baking pan. Sprinkle with remaining sugar. Bake at 375 degrees F for 10-12 minutes or until lightly browned. Do not over bake. Cool on a wire rack before cutting. Yield: 2-1/2 dozen. This recipe was brought over from Scotland by my Great-Grandmother. Combine ingredients and knead until the dough cracks. Roll out 1/2" thick. Cut out cookies. Prick with fork. Bake at 325 degrees Fahrenheit for approximately 20 minutes--until the cookies are golden brown on the bottom.